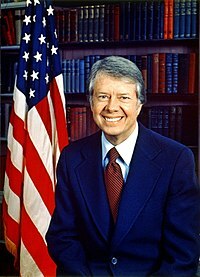 Va James Earl "Jimmy" Carter, Jr. (ruggit er 1 Jerrey Fouyir, 1924) ny 39oo Eaghtyrane ny Steatyn Unnaneysit veih 1977 derrey 1981 as ny 'owder Aundyr Nobel ayns Shee 'sy vlein 2002. Roish haink er dy ve ny eaghtyrane, v'eh ny Chiannoort er y Çhorshey veih 1971 derrey 1975. Ta tooilley coadanyn mychione Jimmy Carter ry-gheddyn ayns Wikimedia Commons.